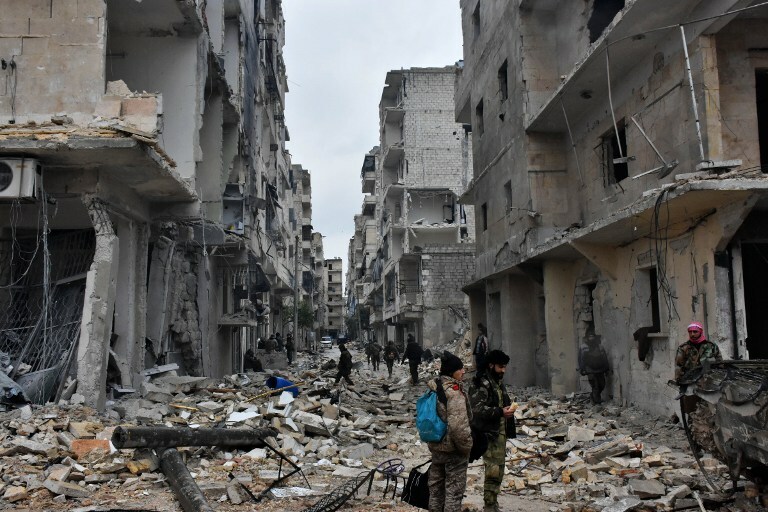 However a source close to Syria's government denied the development, and the Syrian Observatory for Human Rights said hostilities were ongoing after an earlier agreement collapsed. Under the initial plan, thousands of civilians and rebel fighters were due to evacuate early Wednesday the east of Syria's second city, scene of some of the worst violence in more than five years of war across the country. But cold and hungry civilians who had gathered before dawn to evacuate were instead plunged back into a familiar nightmare. "Bombing is ongoing, no one can move. Everyone is hiding and terrified," activist Mohammad al-Khatib told Agence France-Presse from inside east Aleppo. "The wounded and dead are lying in the street. No one dares to try and retrieve the bodies." Officials from the Nureddin al-Zinki and the hardline Ahrar al-Sham rebel groups confirmed to Agence France-Presse that a new truce deal had come into effect after hours of violence Wednesday. "A ceasefire has come into effect in Aleppo after negotiations between the Russians and the Turkish Red Crescent," said Yasser al-Youssef, a Nureddin al-Zinki political official. "The first group of civilians and wounded people will leave at dawn on Thursday [December 15]," Youssef told Agence France-Presse. He said an agreement on rebels had also been reached but did not give details on their evacuation. But news of the deal was denied by a source close to Syria's government. "There is no agreement, the negotiations are ongoing," the source said. As booms from air strikes and artillery fire rang out earlier Wednesday, Agence France-Presse's correspondent in rebel areas of Aleppo saw panicked civilians running for cover. The Britain-based Observatory reported "very intense clashes on every front line" and said at least two people had been killed in rebel areas. State television said rebel rocket fire on government-controlled areas had killed at least seven people. Former Al-Qaeda affiliate Fateh al-Sham Front said Wednesday that one of its suicide bombers detonated a car bomb at a regime position in southern Aleppo. A source with knowledge of efforts to resuscitate the ceasefire deal earlier said Syria, opposition backer Turkey, and regime allies Russia and Iran were locked in talks. Moscow has blamed rebels for violating the ceasefire, saying it now expected opposition resistance in Aleppo to end in the next "two to three days". A source close to the government said Damascus objected to the number of people leaving, claiming rebels had sought to raise it from 2,000 to 10,000. But Youssef from the Nureddin al-Zinki rebel group said the regime and Iran sought to link the Aleppo deal to the fate of Fuaa and Kafraya, two Shiite-majority villages in northwest Syria under rebel siege. It was unclear whether the new agreement included a condition that wounded people would also be evacuated from there. The rebels and Ankara have accused President Bashar al-Assad's regime and its supporters of blocking the evacuation. Turkish President Recep Tayyip Erdogan and Russian counterpart Vladimir Putin agreed in a phone call that ceasefire violations must end. "They stressed that the ceasefire agreement... should be put into practice (and) the violations of the deal must be stopped," Turkish presidential sources said. Turkey said it would meet with Russia and Iran in Moscow on December 27 to discuss a political solution to the conflict in Syria. "We are striving to secure a ceasefire throughout the country and for negotiations for a political solution to start," said Foreign Minister Mevlut Cavusoglu. US Secretary of State John Kerry on Wednesday spoke again with his Russian counterpart Sergei Lavrov, as well as with Cavusoglu and Qatar's Mohammed bin Abdulrahman Al-Thani. "In all of these conversations, the secretary has stressed the need to continue to try to stop the bloodshed and the violence through a meaningful ceasefire," Kerry's spokesman John Kirby said as the secretary of state placed a fourth call to UN special envoy Staffan de Mistura. Syria's army has pressed a month-long assault that has seen it take more than 90 percent of the former rebel stronghold in east Aleppo. Turkey has said those leaving would be taken to Idlib province, which is controlled by a powerful rebel alliance that includes the Fateh al-Sham Front. The agreement came amid international concern about the plight of civilians in the city, and as the UN said it had reports of atrocities being committed by advancing government forces. The UN said Tuesday, December 13, said it had credible reports of at least 82 civilians, including 11 women and 13 children, being executed in recent days. And the UN's Commission of Inquiry for Syria said it had received reports opposition fighters were blocking civilians from fleeing Aleppo and using them as human shields. Aleppo, a cultural and economic hub second only to Damascus in importance, had been split between a rebel-controlled east and government-held west since 2012. It was unclear how many civilians remained in rebel territory, after an estimated 130,000 fled to other parts of Aleppo during the government advance since mid-November. More than 465 civilians, including 62 children, have died in east Aleppo during the assault, the Observatory said Wednesday in a new toll. Another 142 civilians, among them 42 children, have been killed by rebel rocket fire on government-held zones in the same period, the monitor said. Syria's conflict has evolved from anti-Assad protests into a multi-front war that has killed more than 312,000 and drawn in world powers on all sides of the war. Iran on Wednesday hailed the "victory" in Aleppo.